Sadie .. Claw Clip Extension. COLOR CHOICE! Sadie .. Claw Clip Extension. COLOR CHOICE! Sadie .. Claw Clip Extension. COLOR CHOICE! PLEASE ALLOW UP TO 3 WEEKS FOR DELIVERY OF THIS WIG. IF YOU PURCHASE 8 OR MORE I WILL HAVE THEM DROP SHIPPED FROM MY SUPPLIER AND YOU WILL RECEIVE THEM FAST. THANKS. Email me for a discount code. All my items are brand new and have Care Instructions printed on the tags. Gorgeous New TOP QUALITY extension from the Natural Collection. This is called Sadie. This has a claw clip and is layered with a very loose curl. This hangs at about 25" total, but you can also reverse this for a different look and it hangs at about 21" and the hair will be the same length. 1-black, 1B-off black, 2-darkest brown-almost black, 4-dark brown, 8-light chestnut brown, 10-medium golden brown, 12-light golden reddish brown, 14-light golden brown, 15-golden reddish blonde, 16-honey ash blonde, 19-light strawberry blonde, 22-champagne blonde, 24-light golden blonde, 24B-light butterscotch, 25-golden blonde, 26-medium golden blonde, 27-strawberry blonde, 27A-light auburn, 27C-light ginger, 30-medium auburn, 33-dark auburn, 130-fox red, 18/22-light ash brown and champagne blonde frost, 24/14-light golden blonde and light golden brown frost, 27CH24B-Butterscotch, 6/27C-chestnut brown and light ginger frost, 24B/22-light butterscotch and champagne blonde frost, 27/30-strawberry blonde and medium auburn frost, 27C/29-light ginger and cinnamon frost, 33/130-dark auburn and fox red frost, 4T130/27-dark brown mixed and tipped with a frost of fox red and strawberry blonde, 8T124-light chestnut brown mixed and tipped with light golden blonde, 1BH27-off black with strawberry blonde highlights, 12H16-light golden reddish brown with honey ash blonde highlights, 27H24BH613-strawberry blonde with light butterscotch and pale blonde highlights, 16H30H27C-honey ash blonde with medium auburn and light ginger highlights, 266T-white blonde mixed and tipped with white, or 27MB which is the color pictured and is a mix of various reds and blonds. For health reasons and state regulations ALL WIG SALES ARE FINAL. Sorry, there are NO EXCEPTIONS! Would you want to wear a wig that someone else was wearing? You would be in serious risk of catching head lice! Be assured that the wig you purchase from me has NEVER been on a human head! 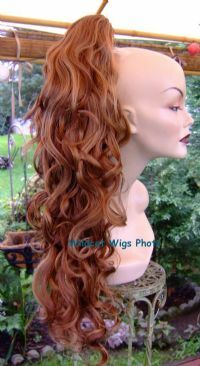 Please check my other great wigs, and save on shipping costs!